Our experienced sales representatives and kitchen designers can design any size room with a functional kitchen or bath for you or we can help you bring your own design to life. At East Coast Building Supply, we specialize in fitting every kitchen or bathroom to your specific needs and budget. You can come in to meet with us or we can come to your office or project to discuss design options. Once you decide on a design that fits your needs, we can provide you with a free estimate to make sure that the materials stay within your project’s budget. At East Coast Building Supply we pride ourselves on making your cabinet buying experience as effortless as possible. So, before you place your order, we will have our experienced design staff come to your project and measure the existing conditions to ensure that you will receive the exact materials that you need to finish the job. 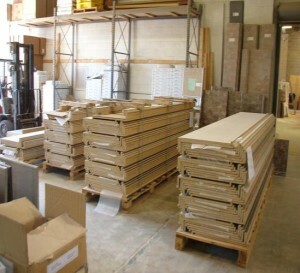 East Coast Building Supply provides our customers with extremely convenient delivery options. Whether you order one cabinet or a whole truckload of materials, we will have trained professionals deliver the material to your project and stock the material in or around the work area that it belongs to. Do you need a licensed and insured professional to help you complete your renovation? Our experienced contractors are ready to assist you with kitchen tear outs, cabinet installation, plumbing needs, and many other renovations. Whether you are replacing a damaged countertop or revamping your entire kitchen with new countertops, we can provide a minimally invasive process that includes the field measuring of your current countertops to reduce the time in which your kitchen is in transition. In a very short time, you can have a brand new look in your kitchen for a fraction of the cost of a full kitchen renovation. East Coast Building Supply Co.
East Coast Building Supply Co. is the leading wholesaler and distributor of complete kitchens since 1980. Please no retail calls, we are wholesale only. © 2019 East Coast Building Supply. All rights reserved.